Funny as i read this, i'm eating a individual pack of fig newtons. I usually take them on my long rides along with gu's but just had the urge for something sweet. It's good that you are keeping healthier options at arms length. I love fruit but try to eat it early rather than late. 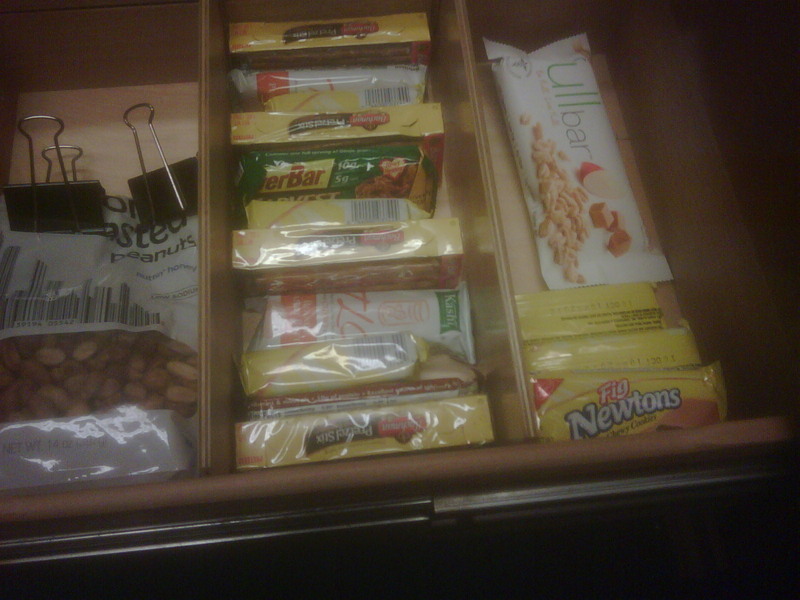 I keep plenty of healthy snacks in my desk too. and a few unhealthy ones.... but yes. gum does the trick very often. I like the fig newton idea. I keep snacks in my drawer too - recently gave away all the Girl Scout cookies that were in there. Too much trouble. I keep a big jar of peanut butter in my drawer for emergency times when my blood sugar crashes, I love bananas and sometimes have the two together. Add a slice of whole wheat bread and that's one of my favorite snacks! Great ideas for snacks. I hit the vending machine far too often. Good thinking, Rock. My favorite snack is now pink lady apples. They are red, not too sweet, and crunchy. I just keep a bunch in the fridge, ready to go. Your desk stash is looking pretty darn good:) I approve of your healthy choices! I do something similar. I have a variety of Zone Perfect bars in my drawer at work, but they need to be broken in half to make a good snack (too many calories otherwise). You're desk drawer looks a bit like mine! Great minds think alike! And I love that gum idea! I saw that on the BL too! I eat fruit everyday and when I was a kid, a banana, to me, was as good as candy. Sadly, so was candy. Sigh. Your Mets are in first now. fruit is actually one of my favorite snacks... bananas, apples, oranges, strawberries, peaches, plums, dried apricots... I'm not a fan of melon for some reason... but anyway. Try it all and see what you like. An apple with a piece of low fat cheddar is one of my absolute favorite snacks. I'm not a fruit fan either. I need to do better on the food front - start by doing something like you are doing, good work. I do love fruit, but also love the new dark chocolate snickers. And around here, the snickers are easier to come by then a banana. I am working on it though - good luck to you. OH and thanks for stopping by my blog! I am trying hard to rest my calf.